Our Belt Conveyors are designed to carry a wide variety of bulk materials and Packed Bags, Boxes, Pouches etc for various industries. Toughed Belt Conveyors are economical and efficient conveying of materials over long distances, either in horizontal or limited inclines. It convey high capacity of materials for Lumpy Ore Stone, Coal And Wood Logs. Suitable for some abrasive and corrosive materials. Pulleys and idlers are designed to high grade. Portable Belt Conveyors are used various Industries for handling Sugar bags, Packed Boxes, Electrical & Electronic Goods etc. 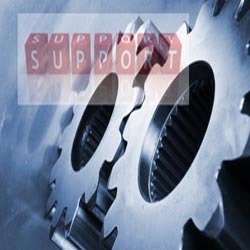 We also supply spares for all Conveyors like Pulleys, Idlers, Buckets, Chains, Scrapers Diverters, Skirt Board etc. Lorry Loader are used to load the Bags and Boxes into the Lorry. These are movable type are used for stacking also. Some time Rough Top Belt is used for Plastic Bags Handling. Screw Conveyors are simple design, easy to maintain, control feed and receiving, suitable for horizontal or inclined even vertical transport of fine powders and granular material. Fitted with free choice of feeding and permits intermediate discharge of material at several points. It is readily made dust tight by jacketing the trough. Roller Conveyors are used to convey packed material, like Pallets, Wooden Boxes, Carton Boxes, Plastic Trays, Crates etc, by means of powered Conveyors and Gravity Roller Conveyor. This is very often used in inline assembly sections in Electronic Industry and loaded on wheels for movements. We have the widest range of rigid, reliable, Cost-Effective Bulk Material Handling system. We are experts in Design, Selection of components, Detail engineering, Manufacturing, Installation & Commissioning of the equipments as per clients specification and needs. We optimize our result by using high end CADD tools like Unigraphics, CATIA, PRO-E etc, as we have a separate R&D for Design & manufacturing. Crushing & Screening Plant for Coal, Mines & Minerals up to 200 TPH capacity. Durable and highly cost effective conveying systems. Designed for limited size and shape of the material.There are three types of elevators Centrifugal, Continuous and positive discharge available for trouble free and vertical conveying of loose bulk materials. Buckets are special formed and spaced in Belt or Chain Elevators. Looking for Material Handling Systems ?